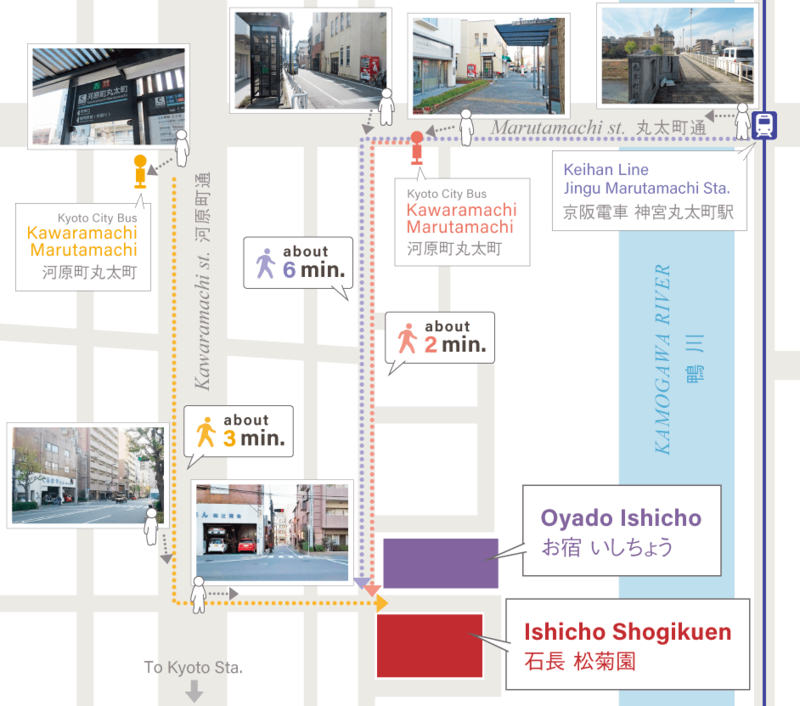 When you're ready to explore Kyoto, our ryokan hotel makes it easy to catch a bus, get on a train, or grab a taxi. From Kyoto Station. Kyoto City Bus: At the JR Kyoto station bus terminal, take No.205 or 17 from gate A-2. The bus will stop at Kawaramachi Marutamachi in about 20 minutes. We are located within roughly 3 minutes walking distance from the bus stop. Subway Tozai line 7 minutes walk from Kyoto Shiyakusho-mae Station. More about Kyoto City Subway. Keihan Kyoto line, 6 minutes walk from Jingu Marutamachi Station. JR Tokaido line 15 minutes by taxi from JR Kyoto Station (Approx. 1,300 yen).